With its smooth glossy surface and high sheen, the Jeffrey Court 3 in. x 12 in. glass wall tile can be installed alongside mosaics and field tiles (sold separately) to create a coordinated look. Penetrating sealers recommended before grouting. Recommend white “polymer-modified” thinset and non-sanded grout for best installation results. 1.33 square foot per piece, each piece sold individually. Piece weight equals 4 lb. 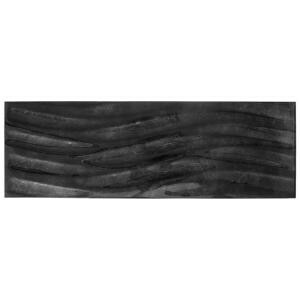 Buy online Jeffrey Court Silver Foil Waves 8 in. x 24 in. x 8 mm Glass Wall Tile 99751, leave review and share Your friends.